Walk In Condos - Condo Suggestions - PixelTail Games - Creators of Tower Unite! I don’t know if they already have it or if I’m just blind, but I liked the fact that you check into a room and goto the door # that you got from the NPC, It made a bit of “Roleplay” feeling to the condos a lot. It was just one of my favourite things to do in Gmod Towers Lobby 1 and 2. If you talk to the NPC in the Tower lobby she will send you to your condo and others can see and enter your door from the plaza. 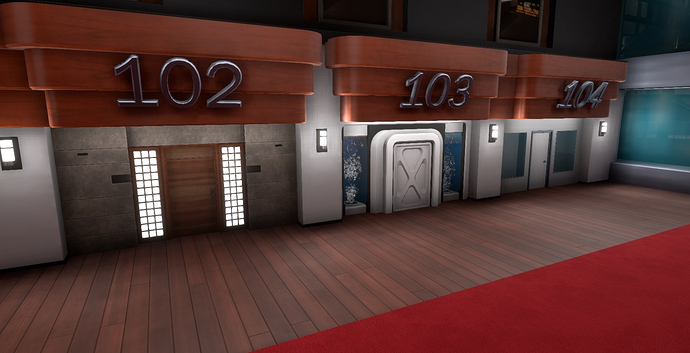 Since Lobby 3’s release all of the doors have been empty, so I don’t believe the condo lobby fully works like that yet. It’ll eventually work in future phases though. hence why it’d be empty since i don’t think many do that? Yeah we are reworking the entire Condo door system.